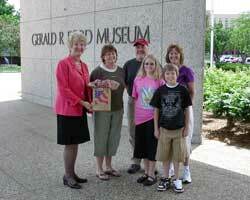 Museum Director, Elaine K. Didier welcomes the Museum's Three Millionth visitors on Tuesday, June 17, 2008. Cindy Lund (in green) was given an autographed copy of President Ford's autobiography. Susan Bales Ford and Steven Ford called Lund to congratulate her. 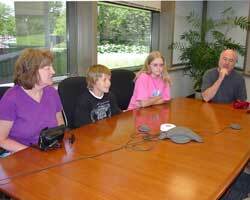 Also photographed are Steve Lund, Connie Dieleman and her children Angela and Daniel. Susan Bales Ford and Steven Ford called Lund to congratulate her.